Rivers Agency just launched a new online savings calculator for Cree – the market-leading innovator of LED lighting – that helps consumers across the United States gauge how much money they could save by switching to Cree’s LED bulbs. A series of easy-to-use interactive “sliders” that allow consumers to obtain instant information about the potential annual cost savings for LEDs. Because you can’t argue with math, the tool pulls data directly from the Energy Information Administration (EIA) to make its calculations. The tool facilitates immediate brand advocacy through sharing tools that sync with Facebook, Twitter, Google+ and email. Users can download a PDF shopping list that includes their preferred bulb needs and can identify the closest retail location to make a purchase. Thanks to the fully responsive experience, consumers can engage with the tool on any computer, tablet or phone. The timing for creating the new Cree Savings Calculator couldn’t have been better as we were in the midst of moving our offices during the development process. Rivers Agency staff gave the tool a test-drive to determine the best lighting approach for the agency’s new space on the ground floor of Greenbridge Condominiums at 601 W. Rosemary St., Space 108, in Chapel Hill. After entering the number of bulbs and estimated daily usage, it was clear that our new office was perfectly suited for Cree LED bulbs. One of North Carolina’s top Web design providers, Rivers Agency built the groundbreaking CreeBulb.com website with Cree in 2013. We’re also one of the leading ad agencies in the Chapel Hill, Durham and Raleigh, N.C., markets. 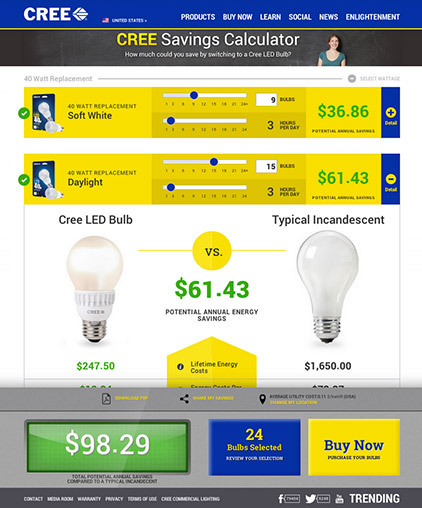 Try out the Cree Savings Calculator today – we’re sure it will shed some light on the subject! I always wondered how much LED was saving me.. thank you!